Your vehicle is equipped with an anchor for securing the tether strap of a child restraint system (child seat). The child restraint anchor fittings are installed on the shelf behind the rear seat. If the tether strap is clipped incorrectly, the child restraint seat may not be restrained properly in the event of a collision. 1. Position the child restraint seat on the rear passenger seat cushion. 2. Route the child restraint seat tether strap over the back of the seat. For vehicles with adjustable head restraints, route the tether strap under the head restraint and between the head restraint posts, otherwise route the tether strap over the top of the seatback. 3. 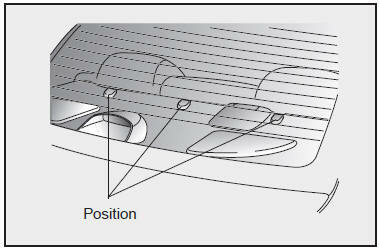 Locate the correct anchor on the package tray behind the rear seat for the selected seating position. 4. Open the tether anchor cover. 5. Clip the tether strap hook to the tether strap hook holder. 6. Tighten the tether strap to secure the seat. Check that the child restraint system is secure by pushing and pulling it in different directions. Incorrectly fitted child restraints may swing, twist, tip or come away causing death or injury.